Feature: It's not often a movie that goes through a troubled or problematic development can produce a reasonable, or even good, movie as the end result. Add in the fact that this particular one is a prequel to one of the most adored horror movies of all time, and you really have an uphill battle on your hands. I'll admit I wasn't totally enamoured with even the idea of a new Exorcist movie, the sequels made so far have all been very lightweight, with virtually no trace of the originals style at all. They were to some degree junky cash-ins, and although I'd also say The Exorcist: The Beginning is cut from the same cloth, I also think that it's overall a far more accomplished effort. The story focuses on Father Lancaster Merrin (Max Von Sydow's character in The Exorcist) played very well by Stellan Skarsgård, a man who's lost his faith and has left the priesthood to dedicate his life to archaeology. Through events shown in flashback form we see Merrin has had a troubled past that's constantly coming back to haunt him. When he is summoned to the backwaters of Africa to a dig that seems to have uncovered a catholic church far older than the documented history of Catholicism in the continent everything, to coin a phrase, hits the fan. The Exorcist: the Beginning (TE:TB) doesn't feel like an Exorcist movie, the archeological angle brings to mind a more supernatural Indiana Jones type tale, but this doesn't really effect the film as a standalone movie in the end. The off kilter style and pacing of The Exorcist haven't carried through to the prequel either, I think for this story, it would have been a mistake to try and emulate it. The style of TE:TB is very mainstream-Hollywood, unlike the original. You watch the original Exorcist and the pacing and style is all over the place, which lets the subject matter sit very uneasily, one isn't comfortable at any time in the movie thanks to this, and its rarely been implemented in a more effective way since. Although TE:TB doesn't try to do anything outside the norm for its atmosphere and mood, I don't think it detracts really, and I found myself not comparing this to the original one at all due to their vastly different styles. The one thing this movie does do very well is make a good modern horror movie. This isn't some weak "pg-13" new-age horror movie that's been made to pander to American ratings systems where all the action happens off screen and the scares are usually just loud sound effects. This is actually a great exponent of adding a bit of class and production to the what in the 80's would have been a low budget "video nasty". Part of this is due to a great cast, there aren't too many familiar faces, but there are some great stand out performances outside of the lead, particularly Alan Ford as Jeffries, who'll be sure to get any female watching the movie squirming in revulsion. Izabella Scorupco plays Sarah, the female lead, and she does a great job of portraying a strong, independent woman with a dark past without becoming a cartoon or unbelievable. The supporting cast is great, and includes a brilliantly smarmy and dislikable role for Ben Cross. TE:TB feels like a good horror movie. You get quite a few good scares, and some very disturbing imagery, it really works as an unsettling film that keeps up the pace reasonably well. It's well above the new movies around masquerading as horror and is only just a bit below the standard set by the last great horror remake: Dawn Of The Dead. If you can watch this movie without trying to compare it to the original, you will enjoy this film a lot more than you might have thought. This brings me to the issues I have with the film, there aren't many, but I still feel they should be noted. The CG used in this movie isn't up to what I have come to expect, and it comes off almost looking like a made-for-TV effort. It cheapens the film as it tests your suspension of belief just a bit too much. Some of the most brutal scenes are let down by amateur CG that have made the difference between a good scene and a great scene. Some of the non CG scenes are amazing, but the bad ones are a bit too frequent for my liking. Also the fact that a lot of the kinds of things attempted in this movie has been done either with better CG in other films or have been done more effectively with more traditional special effects. I do have issues with bad CG in movies, and it does effect my enjoyment if it detracts from scenes, so take my opinion with your own views on how much some half baked CG effects your enjoyment. I am being picky, but I did enjoy this movie a lot, and in a horror movie you need to have the more brutal scenes look as realistic as possible, otherwise you start entering into the realms of cheese-effects, and the horror goes out the window. The only other issue I had with this film was the ending. Its over too soon and feels like its been cut down from its original idea. The pacing just doesn't feel 100%, and a by-the-book horror movie needs a walloping crescendo of a finish to feel satisfying. I found it lacking, and I really count this as the only flaw in an otherwise supremely watchable and enjoyable movie, looking past the CG of course, which is dependant on the viewers tastes. Video: You can't fault this movies DVD picture at all. Its presented in 2.35:1 aspect ratio and looks utterly fantastic. It has been tinted with a yellow tinge in most scenes, but it hasn't effected the detail at all. Everything is razor sharp and loaded with detail. Perhaps this was a reason some of CG stood out too much? It is a glorious picture though, and from the incredible opening sequence to the ending, it all is as good as one could have hoped. In movies like this the black levels need to be especially good, murky and grey black levels can really take the scare factor out of a scene, TE:TB has some of the best black levels I've seen, the impenetrable darkness of some of the underground scenes have you peering into the darkness, awaiting the evil it hides. This movie has some very nice close up shots too, and the detail is always impressive. Audio: The sound is also one of the movie's strong points with an excellent Dolby Digital 5.1 track. There is loads of surround usage, and lots of use of the rears for disturbing noises and effects. The impact of some of the louder effects is also fantastic. There's much activity in all channels; you will definitely be glad you have a 5.1 system, and it will really put it through its paces in some sections with some brutal low end and blistering sound effects. The dialogue is always clean and audible and the levels are always spot on. Extras: There aren't a wealth of extras included, but what's here is reasonable. The commentary by Renny Harlin (Director) does a good job of conveying some of the issues and times constraints that the production suffered, he does his best to explain a lot of how the shoot was done. He goes to great lengths to explain some shots and their purpose which comes off great in spots, but also had the habit of running over other scenes that looked more interesting in the movie, which was a tad disappointing given what I personally would have liked to have heard discussed. He is also quick to point out the shortcomings of some aspects of the production, namely the CG that I mentioned earlier. The time constraints were really the enemy of this production and one can't help if even a few more months were given to the post production that a good movie would have become a great one. Its a good commentary that doesn't fall into the many pitfalls that can make commentaries become boring or ineffectual, and Harlin does a good job for the duration of the film. The only other extra is an eight minute featurette that has some cast interviews and some behind the scenes footage that provides a little information, but is hardly an exhaustive document of the production. The main focus is on the lead character's roles and Renny Harlin's reasons for choosing the actors he used. There's the usual amount of mutual back slapping and compliments for the actors, director and producers, but it doesn't get too gushy and self promotional either. Nice to have on the disc, but not particularly invaluable. Final Say: This a great modern horror movie that doesn't live up to the original's incredibly high standards, but being such a different movie, it doesn't really matter. 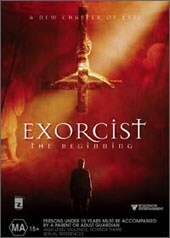 A step above the other Exorcist sequels, and a coherent piece of storytelling with some great individual performances. It shines as a great piece of modern horror that pulls few punches and delivers a highly entertaining and highly polished DVD release.